Welcome back, Dr Greg Charvat! Greg was on the show about a year ago, talking about his startup, Butterfly Network and his MIT short course on the RADAR. Greg has a new book that is about to be released! It’s called “Small and Short-Range Radar Systems”. You can pre-order a copy for 20% off the coupon code AJM33. The book has practical approaches and example data sets. Greg has been celebrating MSU winning the Rose Bowl…even though most nerds don’t know much about sports. Greg’s experiments and hacking of the R390 will be featured in QST magazine in March. CRT tubes enabled RADAR. Something something thermionic rf current. Greg enjoyed the Antique Wireless Association’s coverage of The Titanic’s Radio Transmitter. Another history item, Greg has been reading The Power Makers which is all about early grid setup and power delivery. While most people think of Tesla for AC, his biggest contribution was inductive motors. Now it’s swinging back to DC delivery of power with DC transmission. Even white goods are moving back to DC power, with some fridges using a DC power bus and an inverter going to an AC induction motor to drive a compressor. Greg’s book started at the IEEE Phased Array symposium when he met someone from CRC Press. Instead of working on antique watches at night, his wife encouraged him to work on the book. The entire start-to-finish was 3 years. When writing a book…write for yourself. The Coffee Can (Successive Approximation) Radar project covered in the MIT short course is now a kit! Made by Quonset microwave. A little pricey but easier than sourcing everything yourself, including some soon obsolete components. Sensors too! RADAR is a great way to bounce low energy signals back to a network. Greg has been advising a startup called Fybr (c’mon people, use your e’s!). They make networked sensors for city wide parking space detection (and charging for parking). The NSA leak included a hardware catalog with tons of interesting gadgets. The ANGRYNEIGHBOR used RADAR to bounce some of these signals back to a base station for collection/networking. Crazy stuff! The Space Fence shut down as part of the sequester, but was an awesome way to detect space objects. You could listen on the ham bands. Much smaller, cheaper and available to the public, there is a push to use RTL-SDR dongles to do RADAR. There are some awesome QSL cards from the 50s, linked by Alexis Madrigal’s 5 Intriguing Things newsletter. What do you think? Should we pay to get on shortwave radio in Maine? Thanks to Greg for being on the show again to talk about RF and authoring books. We can’t wait to have him back on to FINALLY tell us about Butterfly Network. Follow Greg on twitter at @MrVacuumTube. Something something thermionic rf current. I had a laugh with that too! The NSA LOUDAUDIO device is a common Knowles hearing aid microphone with an integrated audio amplifier. It pulse-position modulates a low frequency carrier signal, at say 100 kHz. This carrier signal then toggles the gate of a RF FET transistor which has (basically) antennas for the drain and source. When the devices is flooded with a remote RF CW carrier, at say 2 GHz, the RF carrier will become modulated (AM) with the room audio, which is received and mixed with part of the TX signal to leave the baseband signals. The video monitor device acts the same way, only it directly taps the red video line. You need to add the horizontal and vertical sync signals externally. Interesting episode. I enjoyed the radar talk. fyi the spinning thing that is on top of the Google car (and was on our Urban challenge vehicle) is a Velodyne LIDAR ( http://velodynelidar.com/lidar/hdlproducts/hdl64e.aspx ) and not a radar. It has 64 lasers that returns over a million point per second for full 360degree coverage and very detailed point clouds (not as high as a Faro, but still pretty detailed). That ragemaster video sniffing thing, it’s a retro reflector that modulates the reflected signal with the video data in the VGA cable. So it’s not a tiny transmitter, its a modulating reflector. You then need your super expensive radar system to detect and decode the reflected signal. Greg’s right about why military radios are destroyed. A radio is a piece of serialized kit. As a soldier, you could do serious jail time if you loose one. I dunno…does tinfoil stop radar signals? I would buy/rebuild a short wave radio if the Amp Hour was broadcast! Chris, I think you should go on shortwave as Greg suggested. You can set up a poll to see the possible audience! Ha, just saw that you’d posted the flickr stream on Reddit three days ago… I’m behind. Yeah – good show. Greg is always interesting. 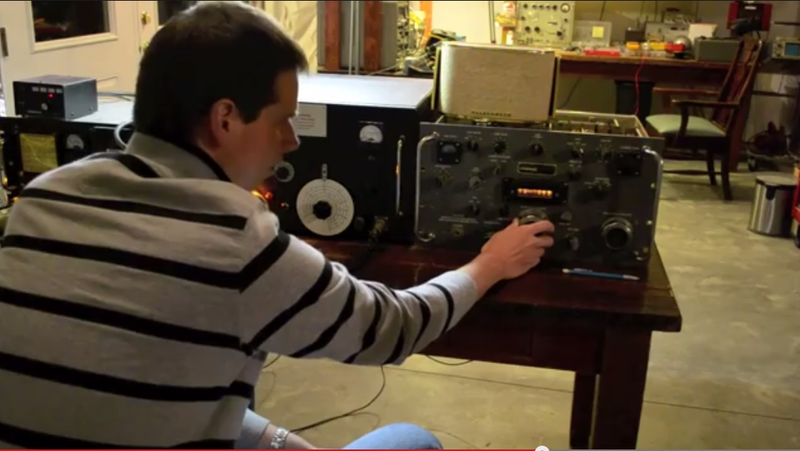 I really liked the use of the R-390’s LO to drive his homebrew SSB transmitter – very cool.